I’m just going to let the bad joke about the Tube Lemma make itself. Oooh…does Sock Munkres have anything about Teddy Baer Addition? Abby–these tubes appear to be partitioning some space. 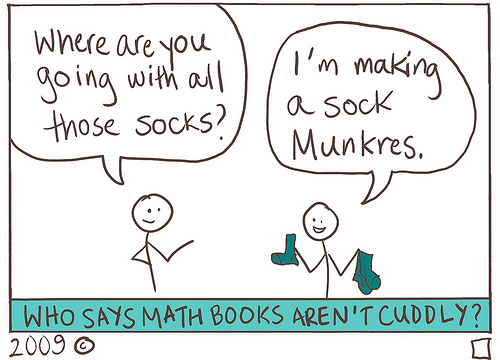 teayourself: Munkres wrote a really sweet Topology book that most grad students see at some point in mathematical life. Hooray!!! I have a 1974 copy of Munkres’ that I first stumbled upon in my Freshman year of college. By the time I was finished with his excellent introduction to set theory and logic I had already decided I wanted to be a mathematician. I actually made a joke about a particular generalization of the tube lemma, which I called the “tube sock lemma,” in Munkres’ topology class two years ago.